This article was originally published in English on the author’s website. “Resisting is pointless,” we hear endlessly repeated. “So many years of protest but the crisis continues, why bother?” insist others, inoculating us with apathy and resignation. “Protests could lead to something that’s even worse,” whispers the machinery of fear. They want us submissive, heads bowed. Dreams of change are forbidden. However, history rebels, indomitable. And it shows us, despite the naysayers, that struggle is worth it. The victories against the privatisation of the Madrid’s public health system, of the Gamonal neighbourhood standing up to speculators and the corrupt, of the cleaners in their battle for jobs in the capital and the struggle against evictions and the banks, are good examples. It is not easy to achieve concrete victories when the political class betray our rights and sell out to capital. It’s hard to win when the state apparatus defends the haves, and rolls back our democratic rights and freedoms. The task of change is arduous, when the media are hijacked by private interests. Still, there are victories, big and small, showing us the way. 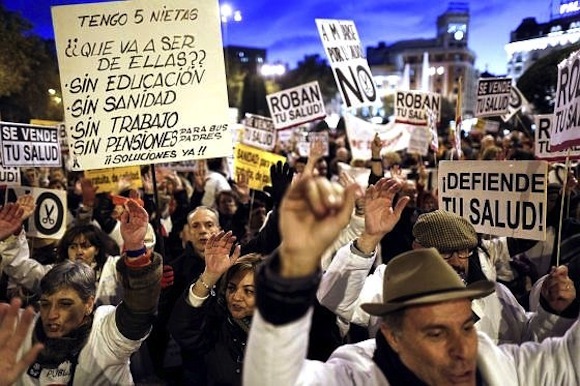 The Madrid government’s u-turn on its plans to privatise six public hospitals is one of them. The [Popular Party-run] administration in the capital has been forced to revoke the “outsourcing” plan after fifteen months of protest and the announcement of the High Court of Justice of Madrid to provisionally suspend the privatization process on the grounds it could pose “serious and irreparable damage.” There have been months of demonstrations, strikes, a referendum with nearly one million votes against such measures, hospital occupations, lawsuits. The triumph swept away its leading promoter, regional health commissioner Javier Fernández- Lasquetty, who has been forced to resign. It’s worth the fight. Gamonal, another great victory. After little more than a week of intense protests, from 10 to 17 January in Burgos, against the construction of a boulevard in the neighbourhood of Gamonal, mayor Javier Lacalle had no choice but to halt construction indefinitely. The conflict, however, came from afar. A multi-million euro project, with huge profits for firms and politicians of the day, in a working class neighbourhood lacking investment and amenities. The “urban” conflict in Gamonal became the spearhead of the fight against corruption, land speculation and crisis. Demonstrations were held across Spain in solidarity with the community. And the attempts to criminalise and spread misinformation failed. It’s worth the fight. 13 days of strike and tons of debris around Madrid were necessary to avoid 1,134 layoffs of street cleaners and gardeners of the City of Madrid. It took an indefinite strike to paint into a corner private contractors that not only wanted to have hundreds of workers, but to carry out pay cuts of up to 43%. The victory was partial because the staff had to each accept 45 days temporary furloughs (unpaid lay offs) annually over the next four years, and a wage freeze until 2017. Still, this does not detract from an indefinite strike , unprecedented sadly in this day and age, succeeding in protecting every single job. It’s worth the fight. roof over their heads. It’s worth the fight. Since the emergence of the indignados, or 15M movement, we have gone from “They do not represent us” to “Yes we can”. We have regained confidence in ourselves. The offensive by capital continues, but our indignation and disobedience increases. Victories today are catalysts of the victories of tomorrow. Struggle is imperative to change things. We must take note. And if we do, we can win. Esther Vivas is an activist in a variety of social movements in Barcelona. She has participated in antiglobalization campaigns, campaigns against external debt, in favour of food sovereignty and critical consumption, against climate change, and in various editions of the World Social Forum and the European Social Forum. She belongs to the editorial board of the magazine Viento Sur.